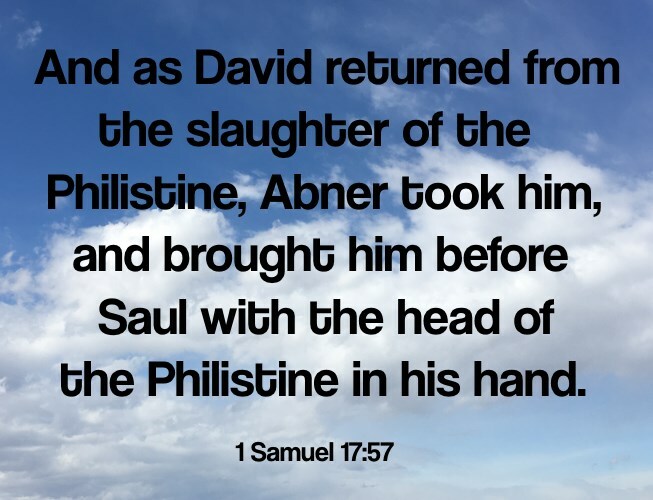 And as David returned from the slaughter of the Philistine, Abner took him, and brought him before Saul with the head of the Philistine in his hand (1 Samuel 17:57). Thy servant slew both the lion and the bear: and this uncircumcised Philistine shall be as one of them, seeing he hath defied the armies of the living God. David said moreover, The Lord that delivered me out of the paw of the lion, and out of the paw of the bear, he will deliver me out of the hand of this Philistine. And Saul said unto David, Go, and the Lord be with thee ( 1 Samuel 17:36-37). Then said David to the Philistine, Thou comest to me with a sword, and with a spear, and with a shield: but I come to thee in the name of the Lord of hosts, the God of the armies of Israel, whom thou hast defied. This day will the Lord deliver thee into mine hand; and I will smite thee, and take thine head from thee; and I will give the carcases of the host of the Philistines this day unto the fowls of the air, and to the wild beasts of the earth; that all the earth may know that there is a God in Israel (1 Samuel 17:45-46). David slew the enemy, and took his head, causing the Philistines to flee. Therefore David ran, and stood upon the Philistine, and took his sword, and drew it out of the sheath thereof, and slew him, and cut off his head therewith. And when the Philistines saw their champion was dead, they fled (1 Samuel 17:51). You say you have faith, for you believe that there is one God. Good for you! 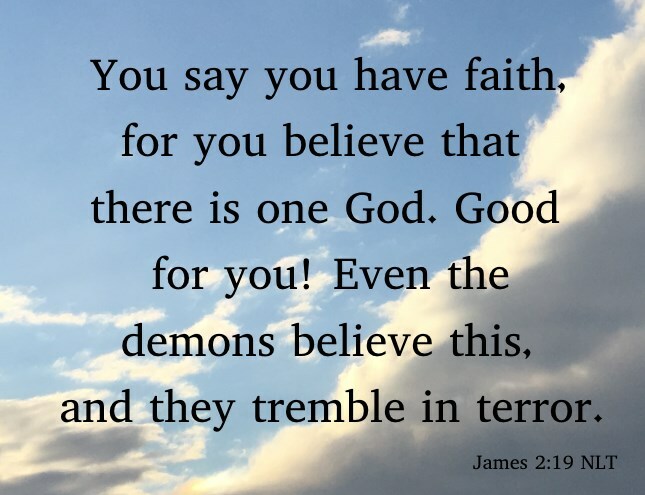 Even the demons believe this, and they tremble in terror (James 2:19 NLT). “I tell you the truth, anyone who believes in me will do the same works I have done, and even greater works, because I am going to be with the Father. You can ask for anything in my name, and I will do it, so that the Son can bring glory to the Father. Yes, ask me for anything in my name, and I will do it! (John 14:12-14). 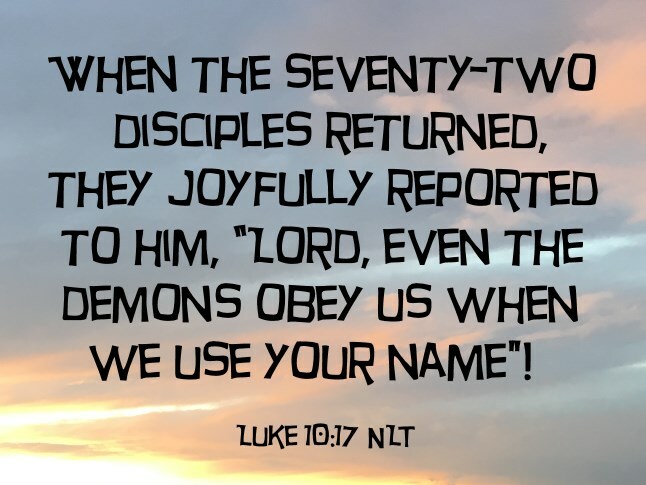 When the seventy-two disciples returned, they joyfully reported to him, “Lord, even the demons obey us when we use your name (Luke 10:17 NLT)"! “Yes,” he told them, “I saw Satan fall from heaven like lightning! Look, I have given you authority over all the power of the enemy, and you can walk among snakes and scorpions and crush them. Nothing will injure you (Luke 10:18-19 NLT). Combining these teachings of our great God and Savior (Titus 2:13), all that we have to do as believers is to ask Him to "Rebuke the enemy of my soul, in the name of Jesus Christ", and He will spiritually take our enemy's head. Hallelujah! If you are doubting this at all, just look at what happened to the demons living in Legion until the Lord rebuked them. They entered about two thousand pigs and all of them drowned (Mark 5:11-13). When the Lord rebukes demons, He doesn't mess around. But don’t rejoice because evil spirits obey you; rejoice because your names are registered in heaven (Luke 10:20 NLT). David rejoiced after the Lord took the head of Goliath. David wrote Psalm 9:1-20) about this great victory. He knew his name was written in heaven.